"Marcus" was co-owned by Junior handler Becky Randall. While never having been shown a lot as Becky persued her university degree, he has had some nice wins including a reserve BIS All Breeds in 1999 and some notable BOB's and at the Southern Gundog Soc. 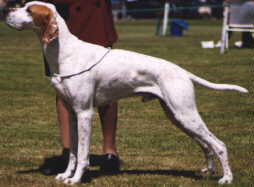 Ch.Show he won the Dog CC from stiff competition. To top it all off on the 30th.Nov 2002 he went Best In Show under Mrs. M E Diesem (Rexford, NY) at the Seddon Districts Gundog Soc. Ch. Show. By doing this he has joined his mother Gr.Ch.Porthcurno Touchin'Wood, her sister Ch.Porthcurno Blue Moon (owned by Marlene Zanders) and their mother Ch.Porthcurno Touch of Gold who have all won BIS at this show. A brother to our Ch.Porthcurno Rose Touch we were thrilled with his achievements. Most importantly however, we wish to thank Becky, sister Sarah, and mother Bev for giving him a wonderful home. Marcus always lived life to the full, and is much missed by all.